For day-to-day locking purposes I use a Keeper 5 disc lock (with reminder cord! ), but I wanted something more substantial for overnight use. Because of this chain�s weight, I wouldn�t use it every day. But it gives me some extra piece of mind when I�m on the road and need to leave my scooter outside overnight, or in a high/moderate crime area after dark. The noose design really makes this chain lock work like a typical chain that is much longer�well worth the money, in my opinion. If anybody else has this lock, I�d love to hear any other ideas for how to secure it to your scooter. The shock works well, but I�m also open to other thoughts! I'm partial to the center stand. 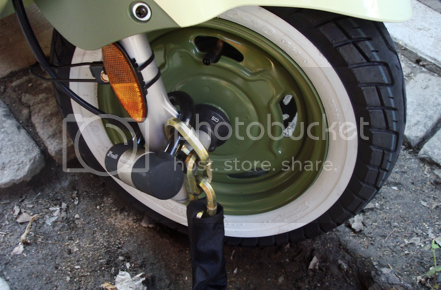 I have a similar chain lock and it can be a pain getting it through the small space between the bottom of the scoot and the stand, but it'd sure be a pain to undo for a thief. When I picked up the scoot, a bunch of us stood in the showroom (shop mechanics, salespeople and the shop owner) deciding where was the best place to lock and that's what we came up with. I've got the OnGuard Mastiff (same thing - beefy hex/reinforced noose chain covered in a heat resistant sleeve with U-lock, roughly 4' in length). I feel that if they get that thing off, they deserve a joy-ride. Well, that and they have a $700 reimbursement policy (more than my deductible) if it fails to prevent a theft. With either brand, I think it's a safe bet, these things are beefy! One thing I wanted to mention: I prefer the center stand as well, however (and I missed this the first time I looked) make sure to slip the U-lock over the thick welded portion and not the slightly skinner bar below the attachment bolts. It's harder to see, but I think that's the most secure place to lock it to; being the frame of the scooter and all. Also, it's just another good reason to wear gloves, as the first few times you lock it there right after a ride, you'll most likely brush the backs of your fingers - HOT!! Just my 2 cents, but I'd take these locks over a cable lock any day of the week. Excellent review, redcass! I moved it to the REVIEWS forum, with a shadow left in GENERAL DISCUSSION. I have the OnGuard Mastiff, which is the same basically, as mentioned above, and this is how the dealer showed me how to lock the Buddy with the chain. Detail of the image is showing the right side of the front wheel. Quite a secure and easy place to access! I'm not sure that's the best way to lock it. It looks as if all you have to do is unbolt the wheel and the lock will slip off the fork. I have a Vino 125 and put the chain through the wheel rim, then lock it. The lock is about 1/2 too big to get through the rim hole, so i'm set. Good to know about the center stand. Sometimes it not possible to reach the wheel. I wish the chain was a tadd longer.